With the rise of Autism Spectrum Disorders I have more and more students each year who struggle with figurative language. 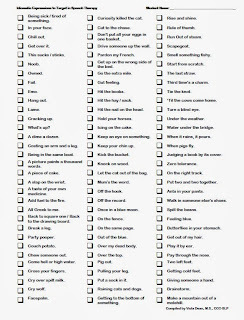 My TpT Freebie for November is a checklist containing a large variety of common idiomatic expressions that our students may come across in different settings. I made this to help me assess which idioms my students are already familiar with and which ones they still need to master. Of course this list is not comprehensive, but it is a start. You can make checks in different colors (e.g., green for mastered, red for expressions that are not mastered) to help you visually organize your targets. 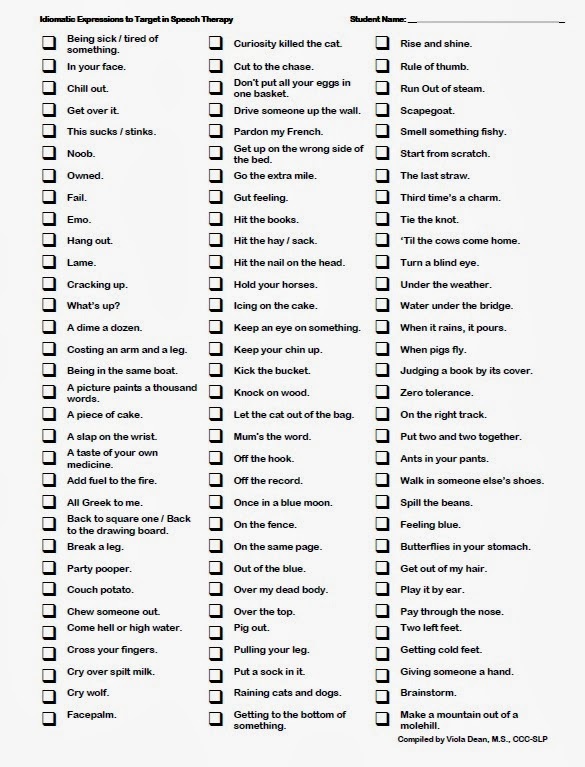 I have also sent this list home with parents and asked for their input as to which expressions they would like me to work on. I hope you find this helpful!